Gift of an anonymous donor in honor of Don Emerson, 2006. Dominikanerkloster St. Nikolaus auf der Rheininsel vor Konstanz, according to a 19th c. note on the verso; Dr. Bremen? ; sold by Venator & Hanstein (Auktion 94, 23 Sept. 2005, lot 419); bought by an anonymous collector and given to the Pierpont Morgan Library, 2006. Ms. altar card (Tabella secretarum) on original cardboard containing two prayers from the Ordinary of the Mass; written in black and red and illuminated in Paris (France), ca. 1520. Altar cards were memory aids to assist the celebrant at Mass. Propped against the back of the altar, the cards contained important prayers said by the priest. This altar card, likely the left part of a triptych, is one of the earliest examples known. A single leaf in Philadelphia, Free Library (Lewis EM 43:21), is a sister to the Morgan leaf and was probably the third section of a three-card altar set. Texts: Gloria in excelsis deo; Suscipe sancta Trinitas. 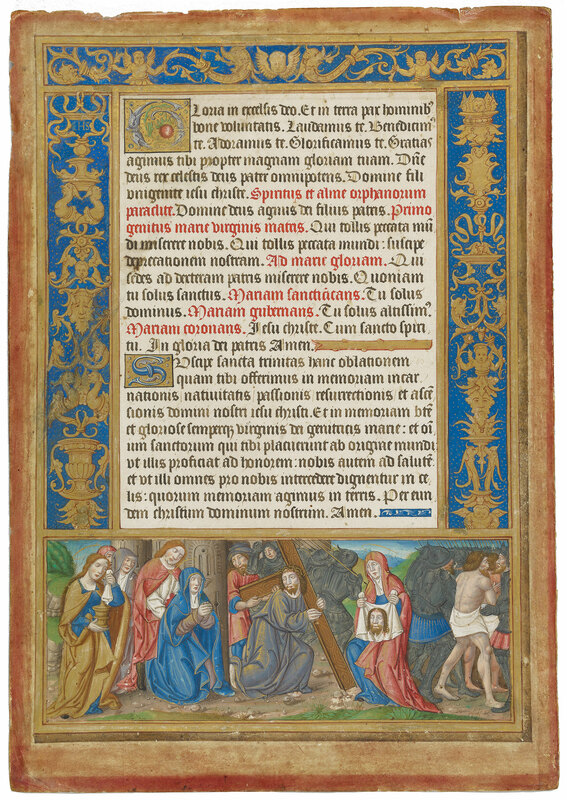 Decoration: 1 third-page miniature (88 x 226 mm), Renaissance border (upper, left and right margin), with gold motifs on blue background (angels, putti, dolphins, vases, masks, inscription IHS, scrolls), 2 painted initials ("G" 3 lines, "S" 2 lines). Artist: follower or workshop of Jean Pichore. The prayer "Suscipe sancta Trinitas," according to Parisian use, appears as the first prayer in the Ordinary (cf. V. Leroquais, Les sacramentaires et les missels manuscrits des bibliothèques publiques de France, Paris, 1924, vol. 1, p. XXII; see also later altar cards, e.g. London, Sotheby, 7 Dec. 1999, lot 32).